mRELEVANCE, LLC swept the E-Marketing and Social Media categories at the 2009 OBIE Awards Gala held at Cobb Galleria Centre earlier this November, winning seven awards. Each year the Sales and Marketing Council of the Home Builders Association presents its annual OBIE Awards. Featuring more then 100 building, remodeling, marketing and personal achievement categories. These awards are the highest honor given in the Atlanta housing industry. We had the honor of being awarded two Gold OBIE Awards for Best Print Ad – Magazine and Best Interactive Application for the real estate blog Atlanta Real Estate Forum. We were also awarded a Silver OBIE for Best Website – Corporate for our own Website, www.mrelevance.com. More exciting than our own awards were the awards we won on behalf of our clients. mRELEVANCE helped capture multiple OBIES for clients, Bowen Family Homes and Heron Bay Golf & Country Club. This is the second year that mRELEVANCE has designed an Award-winning Internet Marketing Campaign for Heron Bay Golf & Country Club. In 2008 the master-planned community took home Best E-Marketing – Best Interactive Application and this year the award winning community received a Gold OBIE for Best Website – Community and two Silver Awards for Best Social Media Campaign and Best Marketing campaign/promotion – developer. Bowen Family Homes took home the Gold OBIE for the Best Social Media Campaign. The campaign was a joint effort on the part of mRELEVANCE and our sister company, Atlanta-based Public Relations firm, Flammer Relations. Each of us on the mRELEVANCE team is honored to see our efforts and hard work recognized by both our peers and our industry. Thank you to everyone who makes it possible for us to continue to produce award winning Internet marketing and social media campaigns. ATLANTA – mRELEVANCE, LLC swept the E-Marketing categories at the 2009 OBIE Awards Gala held at the Cobb Galleria Centre in November. The Internet Marketing firm won a Gold OBIE for Best Print Ad – Magazine and a Gold for Best Interactive Application for the real estate blog www.AtlantaRealEstateForum.com. mRELEVANCE, LLC also received a Silver Award for Best Website Corporate – Associate for www.mRELEVANCE.com. Additionally, mRELEVANCE, LLC also won four awards for clients Bowen Family Homes and Heron Bay Golf & Country Club. Bowen Family Homes took the Gold OBIE for the Best Social Media Campaign. The campaign was a joint effort on the parts of mRELEVANCE, LLC and its sister company, Atlanta based Public Relations firm, Flammer Relations. The Sales and Marketing Council of the HBA presents its annual OBIE Awards every November. 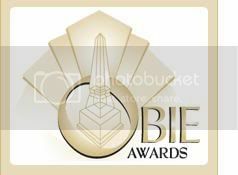 The OBIE Awards began in 1980 and have grown consistently and now feature more than 100 building, remodeling, marketing and personal achievement categories in which one can enter. The awards are the highest honor given in the Atlanta housing industry. About mRELEVANCE: mRELEVANCE, LLC, is an Internet marketing, social media and public relations firm designed to meet client needs in a changing marketplace by building online and off line relationships that are relevant to client success. Combining the talents and resources of public relations and social media firm Flammer Relations with the power of Internet marketing services at MLC New Home Marketing, mRELEVANCE implements a combination of traditional PR services and up-to-date Web 2.0 tools (e-mail marketing, search engine optimization, social media and others) to create relevant results for clients. With offices in Atlanta and Chicago, we can connect your company with buyers and build relevant relationships nationwide. For more information, visit www.mRELEVANCE.com, Fan us on Facebook at www.Facebook.com/mRELEVANCE, Follow us on Twitter at http://twitter.com/mRELEVANCE or call 770-383-3360 or 847-259-7312.